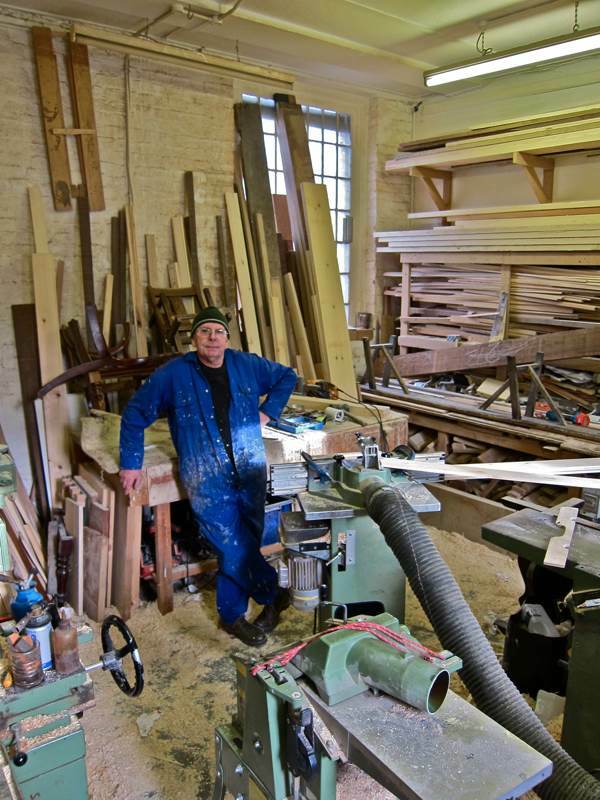 In Spitalfields, Dave Thompson is famous for the blue overalls he has worn as long as anyone can remember, popular for the apples and eggs he brings up fresh from Kent each day, but – most of all – he is celebrated for his superlative joinery. Over the last fifteen years, Dave has been at the core of a group of craftsmen who have worked continuously upon the renovation of the eighteenth century houses and, as a result, he has earned the affections of many of the owners. They treasure Dave for the skill and application he brings to his work, yet such is his magnanimous nature that he chooses to reciprocate their appreciation of his talent with regular deliveries of apples and eggs. Thus it has come to be understood, among those who dwell in the ancient streets beside Christ Church, that only when you are in receipt of Dave’s deliveries from Kent can you truly be said to have arrived in Spitalfields. To seek Dave, you have to look in a special place secluded from the public gaze and known only to the initiated. On the Eastern side of Brick Lane lies part of the Truman Brewery once inhabited by dray horses and coopers, here in an old cobbled yard stands a crumbling stable block where at its furthest extremity, framed by an elegant brick arch, you will find Dave’s workshop. Any residual doubt whether this is the correct location will be assuaged by the presence of the massive pile of scrap timber you see tossed to the right of the arch. Yet, by the time you reach the woodpile, you will very likely already have heard the sound of Dave’s machine tools roaring within his workshop, and you will know that this is the place and Dave is inside at work. Certainly, this was my experience when I arrived and opened the door to be greeted by Dave’s smile, his blue overalls standing out in sharp contrast to the yellow wood shavings and sawdust that surrounded him. I come from a little village, Loose near Maidstone in Kent. At school, I learnt what I could do and I started off in furniture making at Maidstone Art College where I did City & Guilds Carpentry and Joinery, basic and advanced. Then I worked as a cabinet maker in a furniture factory for eight years, making fireside chairs and stuff like that, and I worked in East Farleigh making bespoke kitchens. I was lucky to get the chance to come to London but it was a big gamble – I was offered the choice of being made redundant and getting five thousand pounds, so I took it. 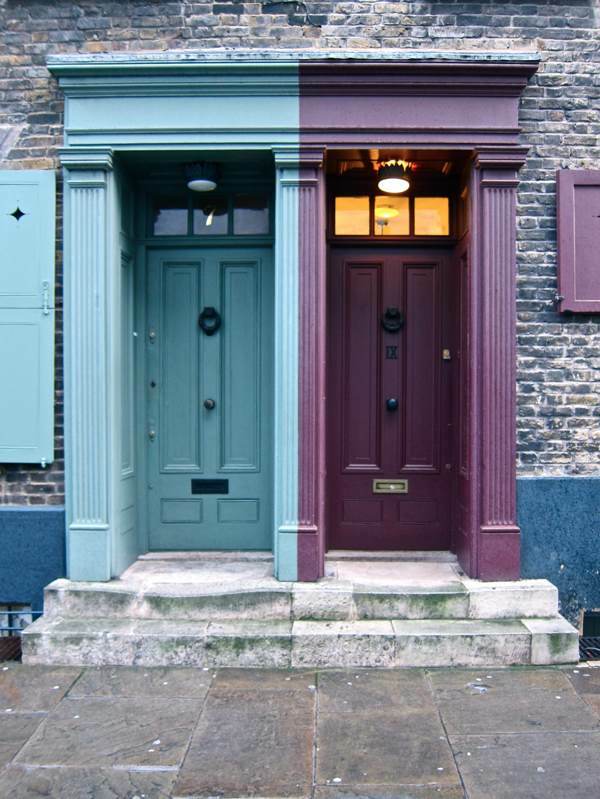 When I first came up to Spitalfields fifteen years ago, I was restoring 1 and 3 Fournier St for James Hutcheson. He had a showroom at the front and I had my workshop at the back, but after three years he sold number 3 to Marianna Kennedy & Charles Gledhill, and I worked for them. That was six years of my life, then I moved over to the Truman Brewery stable block. I knew nothing about the restoration of old buildings when I first come up here but I learnt a lot working with Jim Howett, he’s been here thirty years and he’s got a lot of specialist knowledge. If you can do something like mouldings, everybody wants you to make them because in every old house the mouldings are different. One of my specialities is fitting shutters in rooms that don’t have shutter cases and making new panelling. I’ve done a lot of external shutters in Wilkes St and Princelet St. When you do restoration, you try to use the old timber. Often if the panelling is damaged, you can patch it up and put it back. It was all good work they did in the old days. They didn’t have the tools but they had all the time in the world. I’ve never had to look for work, I’ve been up here so long now that people just come to me – but it’s been hard, for years I got up at four thirty every morning to get into London by six. In Eleanor Jones’ house in Fournier St, I put in a big pair of curved doors on the first floor that are the same as on the ground floor. I had a lot of curved work to do the bay window and Bogdan helped me, he was a very good joiner from Poland. The two of us put our heads together and sorted that out. One day, he came in and said he’d been to the specialist. It was cancer. He’d had his chips. He did quite a lot of work around here and extensively renovated the Market Coffee House. He was one of the best. Since then, I’ve done a lot of work for people in Fournier St. When I started, I used to fit shutters, internal and external, but most of the time now, I’m doing work for people making joinery for their carpenters to fit on site. As you get older and wiser, you don’t fit it, you make it and leave that to someone else. Matt Whittle and Tony Clarence are two blokes I work with, we started at the same time fifteen years ago. There was quite a little gang of people and we all got to know each other and we’d be working together restoring the same houses. Sometimes, the people would sell the houses, and we’d get paid to rip out the work we did and then do it all over again to suit the new owner. About three years ago, I had a quadruple heart bypass. I used to work quite long hours but now all I do is get in at six and work until three, four days a week. Not so stressful. I’ve got an old farm cottage in Loose. Unfortunately, it’s only a two bedroom cottage. I restored it myself and I like to be comfortable. I’m sixty-five in April, I don’t think I’ve got many more years – though it is getting to the stage in Spitalfields where there is less and less to do. But I’ve left my mark and I’m proud of the work I’ve done here. 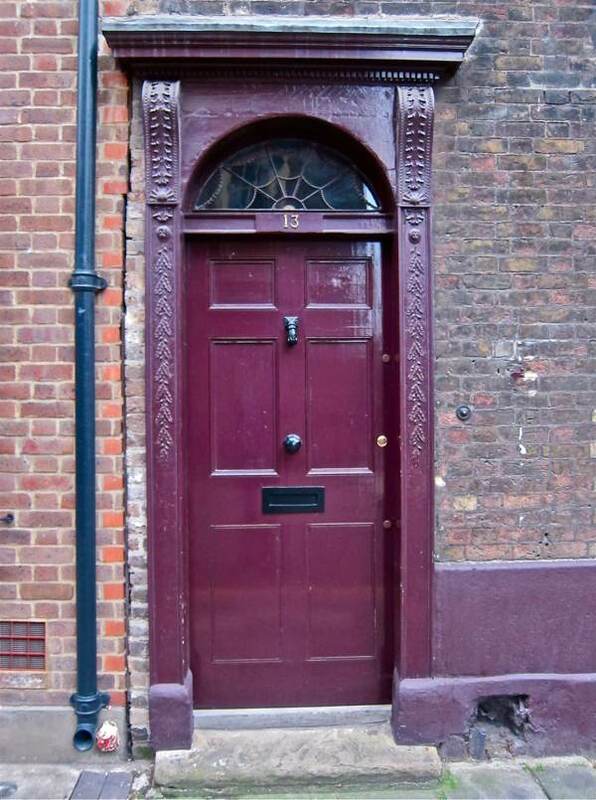 One day – to his alarm – Dave saw that some contractors had tried to cut corners by tearing an eighteenth century door case off the front of a house in Wilkes St and throwing it in a skip. Yet thankfully, when the building inspectors enforced the listed status of the building, it was Dave who got the painstaking job to piece the fragments back together and reconstruct it with the help of Diana Reynell (a grotto designer) who restored the mouldings. And the dignified door case in question stands today, as if it had never been broken. The emotionalism with which this event is charged for Dave reveals the depth of his personal involvement with these old houses. His conscientious labour over all these years has comprised the culmination of his life’s work and it honours those craftsmen whose work he has furthered. Even as he and his fellows have pursued the long task of restoring these buildings, residents have come and gone, raising the question of who – if anybody – truly has ownership of these properties. Because, as much as these buildings manifest the status and taste of their occupants, they also commemorate the talents of the artisans who have worked upon them, both recently and long ago. 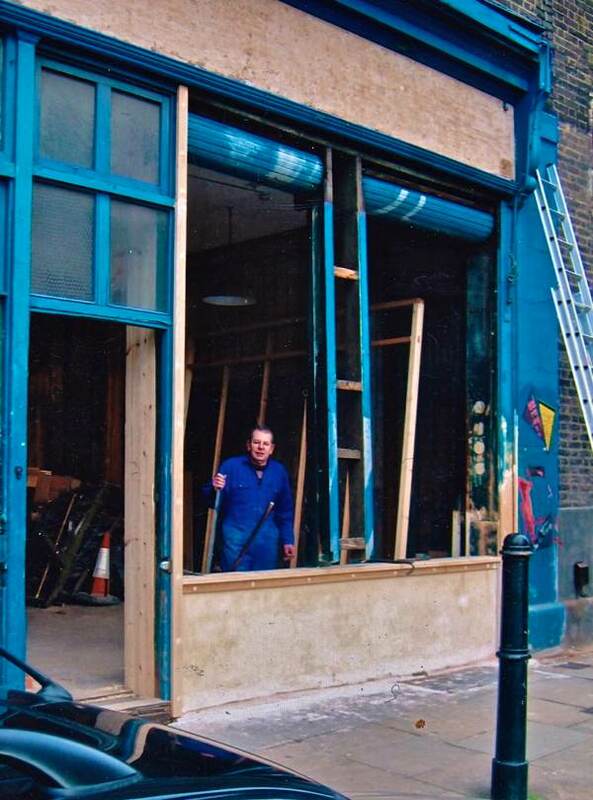 Dave worked on the restoration of 1 Fournier St in the nineteen nineties. 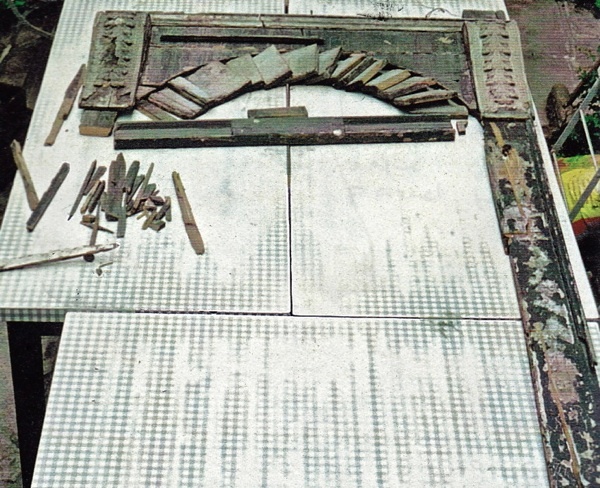 Fragments of the eighteenth century doorcase torn from the wall but rescued from the skip in Wilkes St. The eighteenth century doorbox reinstated by Dave at number 13 Wilkes St and replicated at number 1. Doorboxes at 7 & 9 Fournier St by Dave, commissioned by neighbours John Nicolson and Kate Jenkins. 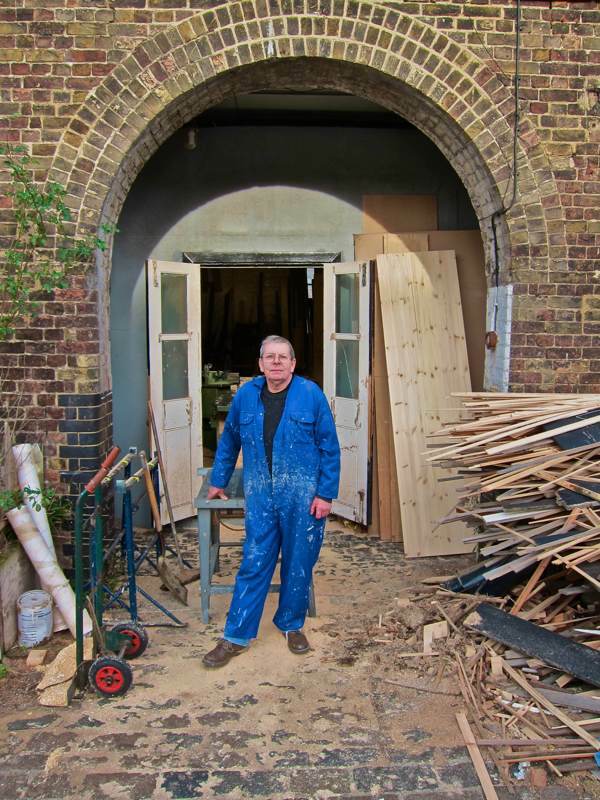 Dave Thompson, joiner, outside his workshop in the former stable of the Truman Brewery. A true craftsman. I love that picture of Number 7, where you can see the top step has been worn away by the tread of generations. So glad that there are people out there who care about looking after these wonderful old buildings. more and more i am admiring the work of people who upcycle — rescuing things from the garbage and restoring or repurposing them. it’s an ethos that will serve us well. oh how we laughed that time you made those shutters back to front! seriously though … where would we be without you – you cheeky monkey? “Even as he and his fellows have pursued the long task of restoring these buildings, residents have come and gone, raising the question of who – if anybody – truly has ownership of these properties. Because, as much as these buildings manifest the status and taste of their occupants, they also commemorate the talents of the artisans who have worked upon them, both recently and long ago.” …Exactly right! Well said!! where can i find dave – does he have a phone number? Just go into the Truman Brewery and ask for him, Louise!